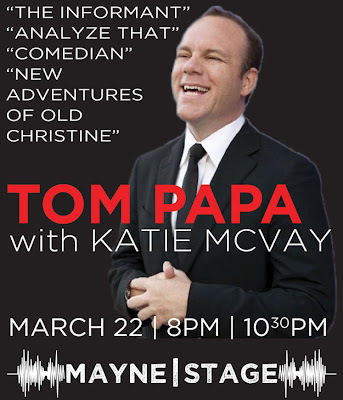 Comedy Of Chicago: Interview with Tom Papa! Tom Papa's got that face. The face that you immediately recognize... and he should have it, he's worked hard for that face. The man's list of credits is so prolific it's almost ridiculous: 20 years as a WORKING stand-up comedian, television credits, Hollywood films, a radio career and THREE Comedy Central specials, the most recent of which is an hour long show directed by Rob Zombie. He's worked with Michael Douglas, Matt Damon, Robert DeNiro, Jerry Seinfeld, Steven Sodebergh... the list goes on and on. Late night TV? Forget about it. Papa has had multiple appearances on the The Tonight Show with Jay Leno, Late Night with Conan O'Brien, and the Late Show with David Letterman. Papa's been on my radar for some time now but unfortunately I've not had the opportunity to see him perform live. Until now. Papa will be performing his unique sardonic style of comedy this Friday March 22 @ The gorgeous Mayne Stage Theater. If you haven't been to the Mayne stage yet, here's your chance. The theater is absolutely stunning, great lighting, not a bad seat in the house, perfect sound, a pro venue all the way around. Check out this video of Papa doing his thing + read the interview & then get your tickets before the show sells out! Papa was was cool enough to take time out of his busy schedule and chat a bit about comedy. Comedy Of Chicago: You done everything from acting in movies to radio broadcasting, how important is it to keep stand up comedy in you repertoire? Tom Papa: It's never left. I always make sure to keep doing it. If don't do comedy for a few weeks I feel weird, It's one of those thing comics say a lot but is really true, like somethings not right. It's what I like to do the most, what I have the most fun at. COC: Have often do you perform in Chicago, and how do you like the scene here? TP: Love Chicago, done a lot of shows here, great comedy town, seen it go from a few clubs... to only one club (Zanies), and now back to several clubs. It's good to see how many major clubs are coming back, like Laugh Factory Mayne Stage, etc. COC: Whats it like working with Steve Sodenbergh? TP: Working with Soderbergh it's the best experience. It spoils you. It really does. Ask anyone who has worked with him, Matt Damen etc, they all say it spoils you. You want to be on that set. Some projects that you work on you just stay in the trailer the whole time because you hate the process. But on a Sodenbergh project, you can't wait to get to work. COC: Open Mics are real strong here in Chicago, it's where veteran comics consistently go to practice the craft. How was the open mic circuit when you were coming up? TP: I got started in NY at bringer shows, that's where you bring a group 5 or 6 friends and then they (the open mic producers) will give you some stage time. Eventually you have to move on to normal rooms because you cant just perform in front of friends all the time and open mics help you gauge your progress. Open Mics are hard though, because it's mostly comics waiting to go up, but that's also good because it's where you will fine tune your best bits... I occasionally will still hit them. Opening for Papa is Katie McVay: A Chicago comic, cast member of Chicago Underground Comedy and producer of Two-Hour Comedy Hour and Speakeasy Comedy and all around madwoman.